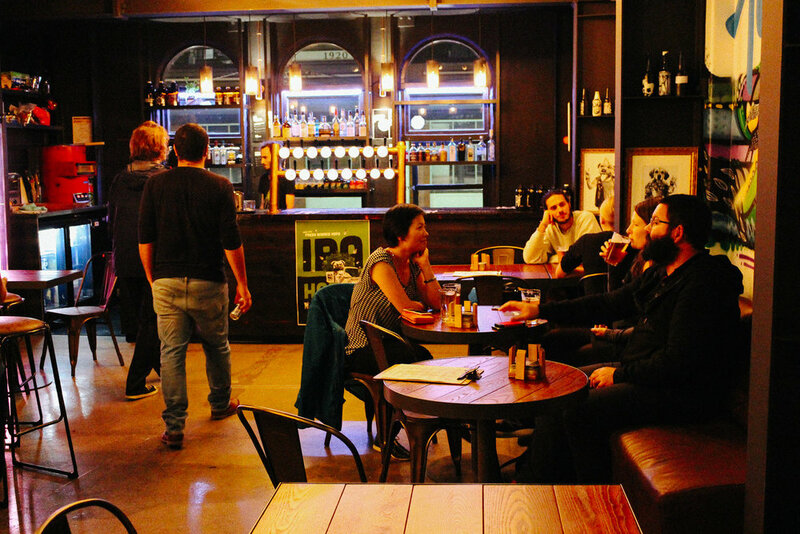 Wellington has quickly become the craft beer capital of New Zealand. And it's showing no signs of slowing down. 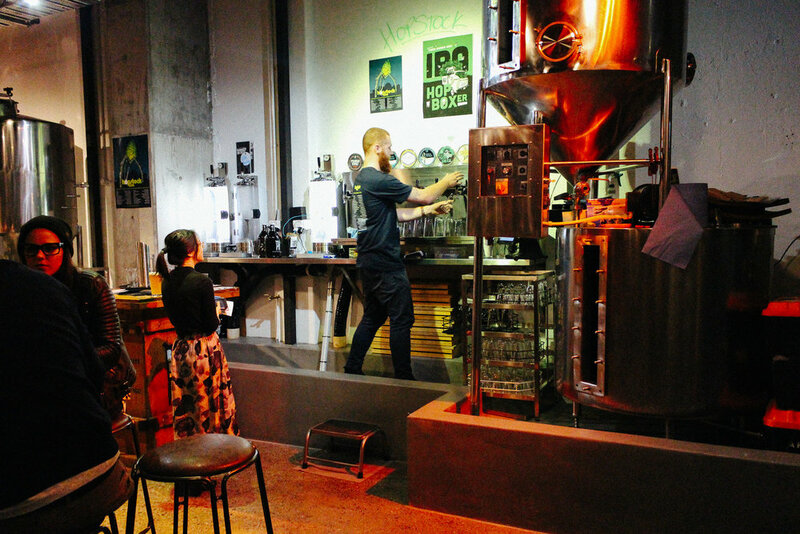 One of the latest spots in town for a quiet beer is the new site of Black Dog Brewery, tucked up at 216 Cuba Street. And what a space it is! Re-housed from its former site off Courtenay Place, one cannot help but feel that this is the place the faithful hound ought always to have been (no offence to Courtenay Place, ya know). The new brewery is a two-level Edwardian building that dates back to the early twentieth century. From the moment you walk in, either via the little shopfront down below, or up the steep steps, you get the feeling you're entering not a bar, but someone's cool living room. Inside, the first thing that struck me was the huge amazing mural (Black Dog partnered with three local artists – Kelly Spencer, Mica Still and Sean Duffell – to create a large wall mural depicting the brand’s collaborative spirit saying 'Come Together, Right Now' to paraphrase the Beatles). Best of all, it's being run by Wellington Resident, my pal Mat Bayly. (Disclaimer: I think Mat from Black Dog is the coolest because he was nice to me when we worked together). Mat Bayly is one of the loveliest people I've met - down-to-earth, jovial and sweet. He's always got a smile on his face, even when he pulled a 16-hour shift. Knowledgeable, helpful and with an ability to shift from the cool kid's scene to corporate in a heartbeat, Mat is someone you want on your team. No wonder Black Dog gave him so much responsibility when it came to establishing their latest flagship. Who is the Manager of Black Dog Brewery Wellington, Mat? Mat was born in London, where he lived until he was two years old. "My mum's from Mosgiel" he explains. 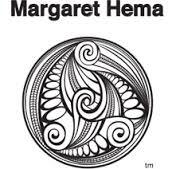 "She worked in social work and teaching of children with behavioural engineers. My father is an electrical engineer who went a bit hippy. He also was a bodybuilder for a time." When Mat was a kid, he lived in Timaru, Cromwell and then Dunedin. "I was quite into my sports as a kid, and also a bit of a nerd. My mum remarried when I was six, so we got a new family come into the mix. Timaru was a pretty un-outrageous" Mat says. He studied Science in Dunedin before getting into beer. How did Mat discover the world of craft beer? While studying, Mat worked in multiple jobs in hospitality, including fine dining. "I got into beer when I was 18. I went to the UK and ended up running a real ale pub in the middle of nowhere. You would pour ale warm from an actual cellar. It got me into beer more seriously, and I started to brew in Dunedin, where there's a good homebrewing community" Mat says. "There wasn't much of a good craft beer scene down there, however. For the most part, my knowledge of beers has expanded since moving to the Capital." 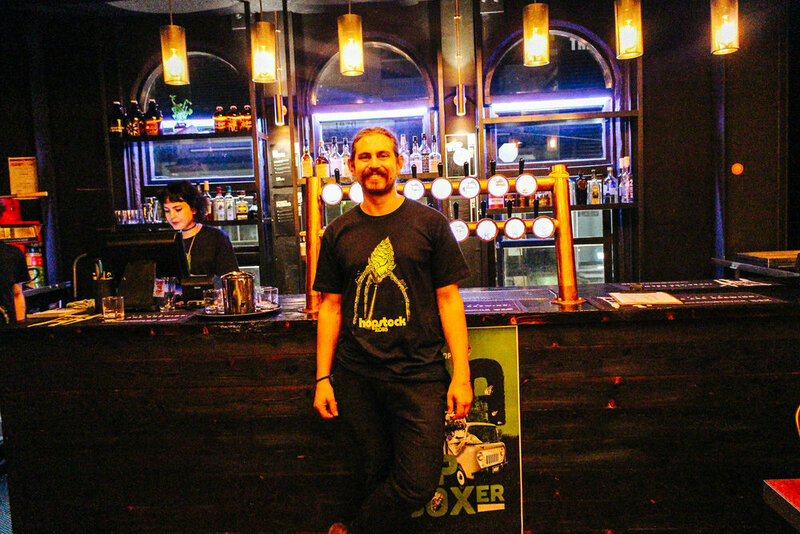 When Mat moved to Wellington, he took a job as a part-time duty manager at Black Dog Brewery, formerly on Blair Street. He progressed to become the bar manager and supervised the move from Courtenay Place to Cuba Street. 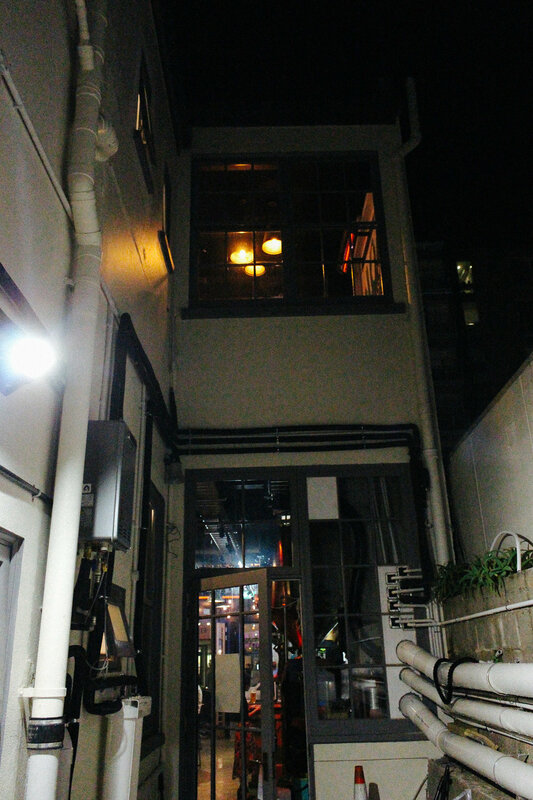 "Our lease was up" says Mat "and we didn't quite have the right conditions to renew so we decided we wanted to move up to Cuba Street where the vibe fitted Black Dog better." How has he found moving to the new space? Adjusting to the new space was a challenge and took lots of blood, sweat and beers (pun very much intended). "It was a blank canvas" sighs Mat "We had to put a lot of work into making it a great space to have a drink, from the street art on the walls by amazing locals like Mica Stills and sound-proofing the roof." Although it was a hard slog, with disappointments along the way like being unable to open in time for Cuba Dupa, the work has now paid off for Mat and his awesome team. Isn't Black Dog owned by a big corporate (DB breweries)? Doesn't that compromise it in any way? Yes it is, explains Mat, but the Brewery is both smaller and more independent that one would think. The incarnation story of Black Dog is one of craftsmanship and happenchance. Black Dog Brewery started up from within the inside of their parent company, DB in 2011. "There was a European style club on Cambridge Terrace DB owned called 'Temperance' that shut down. There was a lease for which DB still held the lease" he says to me over a pint. "Some guys started brewing on the site, and the brand grew out of that. Adrian Klemp, the brewing manager, got and continues to hold significant control over the brand pretty quickly." Mat explains. "Our first beer, Chomp, was such a hit that the guys had the full backing of the company to do what they wanted on the kit. Black Dog won awards - we entered separately from DB - in total more than all the other DB beverages combined. Because we were winning awards, DB more or less left us alone." Mat sees the best thing about the bar as an opportunity to do what they want but with more support. "The guys last year decided to re-brand and refocus the core beer offering before our move. For the most part, we're completely independent in-house. DB only gets involved in the marketing and sales and stuff, which gives us creative freedom and to have fun in-house. Adrian is in charge of sales in-house and we get to have proper backing financially, but also to really work on our craft rather than the corporate side of the business." 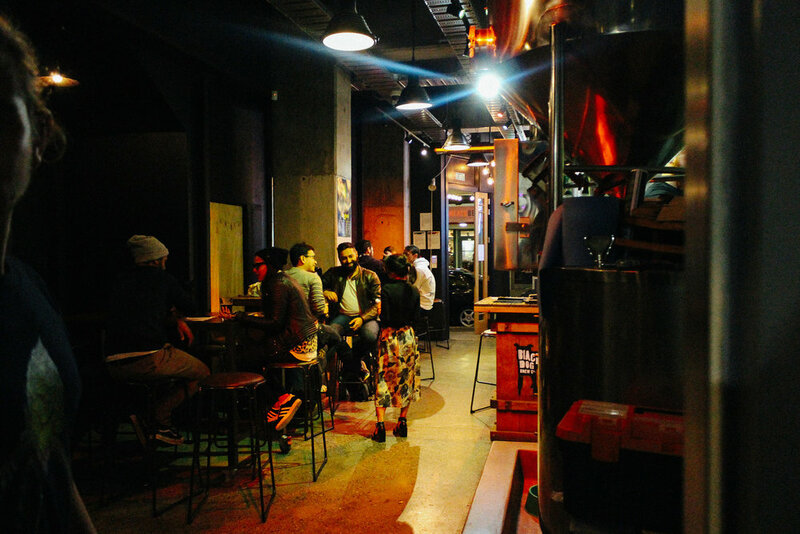 Black Dog Brewery is also about the local collaborations, including their 'Brewtus' beer which was a collab between Havana Coffee and one coming up in 2018 which is a collaboration with Wellington Chocolate Factory. More collaborations are underway, as Mat tells me that the bar will soon get more food delivered from neighbours Grill Meets Beer, Heaven Pizza and the local fish and chip shop. Mat now thinks of the Cuba Street bar as his baby. "You get so involved in all the details which no one else sees and have to be responsible to make it come together. In a month, or so, we will have the whole thing down pat. But for now, sometimes we struggle to find space to make things fit! Teething problems everyone encounters in a new space, which is stressful, but it's fun and exciting too." What beer events does Mat rate in Wellington? Beer events are Mat's focus. "I love Hopstock, and of course Beervana. It's such a great chance to catch up with everyone around New Zealand and find out about what they've been up to. People just want to connect with one another, because we're all so passionate about the beer scene. I also love Malthouse's events, like Darkest Days and West Coast IPA challenge. Showcasing what everyone is up to, what is new, what is different, is so important. Everyone has their own styles, and building knowledge of these is amazing. You just build such an appreciation. I used to really dislike sour beers but now I really enjoy them. Everyone is pushing each other to do different things, from the Garage Project guys to the old guard who've been around for a while. When we have good beers, everyone wins." "I love the bohemian vibe of the city. It has more of the arts, culture - the finer things in life. There's more happening in Wellington. In the scheme of things, Wellington is small and New Zealand is small. But here, there's always something any night of the week and there's always a good beer to be had."